* Lightning is an electric discharge, a large electric-arc or spark. Electrons can be removed from objects by friction, heating etc and are stored temporarily on an object, called a capacitor plate. When enough charge is built up, or when the capacitor plate gets near enough to another plate with less charge, the excess electrons jump to the other plate. The jumping is called electric discharge, same as lightning. * There is also sometimes positive lightning, which apparently involves mostly protons doing the jumping to the other plate. * It's uncertain where the electrons [or protons?] are initially separated, but the Earth and its ionosphere, which is about 600 miles thick, starting about 30 miles above the Earth's surface, are apparently capacitor plates. The ionosphere seems to get charge from the solar wind, which is positive charge, mostly protons. Most lightning is electrons from Earth apparently drawn up to the ionosphere, but some lightning is positive lightning, apparently drawn down to Earth from the ionosphere. Most lightning on Earth doesn't jump directly from Earth to the ionosphere, or vice versa, but gets stored in storm clouds temporarily. * There are said to be 100 lightning strikes per second worldwide. Hey PotterPan- if you follow the link below, there are quite a few TPOD articles under the 'Lightning' heading that talk about the nature of lightning- both the conventional low altitude stuff, and some of the (much cooler!) higher altitude stuff... and even lightning on other planets! * In my previous post I think I misstated Kanarev's view on electricity. I thought his finding was that photons carry the energy of electricity, but in my post in the NPA thread here, http://thunderbolts.info/forum/phpBB3/viewtopic.php?f=3&t=4284&p=50555#p50537, I quote him saying that only electrons and protons carry electrical energy in electric circuits. And the protons he says do so only in air and water, not in space, although I imagine he's wrong about that. * This looks like ribbon lightning, but it doesn't involve wind blowing the ion stream or multiple exposures on film. It's from a Tesla coil. So maybe the previous explanations for ribbon lightning are wrong. * By the way, Botoxic mentioned a few websites that explain electricity pretty well, so I started a thread to post some of that material at http://thunderbolts.info/forum/phpBB3/viewtopic.php?f=3&t=4491. Is the Above Image Time-Lapse? Someone said: And if one reads the caption of the article it's used in, one sees it's almost exactly like ribbon lightning. 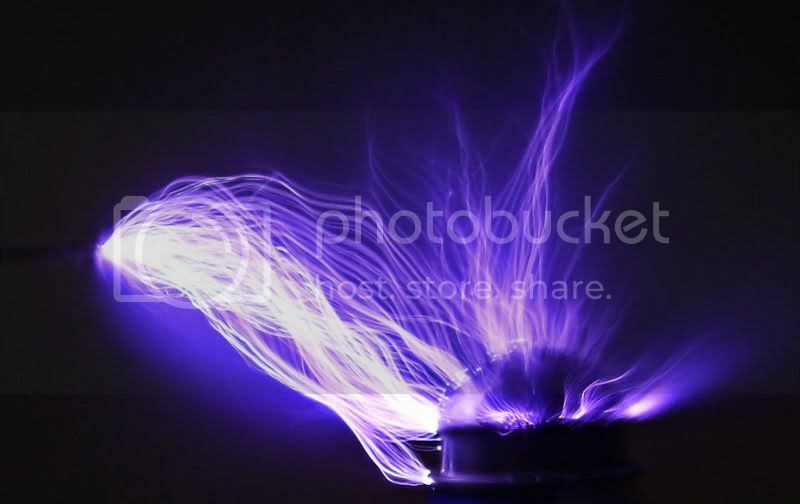 - "Long exposure photograph of a Tesla coil showing the repeated electric discharges." - Multiple successive 'similar' strokes (due to very similar B & E fields, I'd wager, at the time of each subsequent stroke) captured in a time-lapse composite image. Which isn't to say that multiple strokes COULDN'T happen at the same time. Not sure under what specific circumstances filamentary sheet currents occur? * I don't think the ribbon streamers shown here http://i104.photobucket.com/albums/m166/csneed/PC080002-1.jpg are time-lapse images. * This is the site I mainly wanted to show evidence from, http://www.electrotherapymuseum.com/2008/3inTests/index.htm, but I temporarily misplaced the link. * There are numerous ribbon streamers shown and they seem to be real-time, not long-exposure. Does the last image here look like long-exposure? I think not. * Someone commented as follows on my quotes. * At any rate, it looks like wind isn't likely involved in moving the ion stream etc. Thermal heating or air currents are the direct cause of this phenomenon. You are seeing a vary rapid sequence of individual sparks spread out over a brief time interval. > * Also, it's odd that the streamers apparently don't intersect. The "weakest" path through the air is the hot channel left by the previous spark channel. The path is merely shifted to a sightly displaced position by air currents before the NEXT spark comes along. Since the still-hot path of the previous discharge is more tempting, the following spark has no need to break down a "new" path. It merely retraces the path left by the previous spark. In effect, subsequent discharges are intersecting (or at least retracing) most of their previous path. A sequential series of sparks is blown by the wind similar to the way a smoke trail moves downwind. The paths may also rise due to self-generated heat. * Here are a bunch of photos of similar ribbon streamers, at http://www.electrotherapymuseum.com/200 ... /index.htm. These aren't time lapses, are they? The last image shows a person along with the ribbon streamers. That's not time lapse, is it? They are similar to time lapse photographs. Tesla Coil sparks typically occur at a rate between 100-400 sparks/second. If the camera's shutter was left open for 1/10 of a second, you'll see between 10 - 40 individual sparks in the resulting image. If there is a lateral air current, each spark will be slightly displaced from the previous one, by a distance of D = V/R where V = the velocity and R is the spark recurrence rate. Completed Tesla coil sparks do not occur simultaneously, they are a series of sequential sparks. A similar thing occurs with ribbon lightning. In fact, it is virtually impossible for long sparks to form nearby paths simultaneously. The first propagating leader to "win the race" prevents further progress of any nearby/slower leader(s). The winning path becomes the completed spark channel. The path of least resistance, if/as I understand it, is predetermined before the discharge occurs. Upon discharge the path becomes illuminated as particles in the path convert the electrical energy to heat, resulting in light. The discharge may alter the ionization of the particles in proximity to the path, and thus changing the local resistivity/path of next discharge. In natural lightning, the moisture/rain/hail in the air along with air particle movement moderates this altering ionization in a somewhat chaotic manner, setting up conditions for ribbon lightning, which I see as a multiple path scenario. I think this description holds true for the Tesla coil discharges also, minus the moderating effects of water droplets. To test this, I would want to see the discharges in both a vacuum and [water]vaporized environment. In a plasma globe this can be simulated by rearranging the contact area on the surface from a point like contact to a segmental region. What might I be missing here? Is "ball lightning" simply scattered bead lightning? In high-energy plasma lab discharges researchers have found that hot plasma ‘beads’ (known as plasmoids) form along the discharge axis before “scattering like buckshot” when the discharge quenches. Bead lightning is most apparent when the current in a cloud-to-ground flash persists for an appreciable fraction of a second. In these cases, the luminosity also persists and the channel may have regions of enhanced luminosity that resemble a string of beads. The first few seconds of this super slow-motion video of a lightning discharge appear to show plasmoid balls flying off one of the filaments and heading away into the sky. Whereas other plasmoid balls remain pretty much stuck inside the magnetic fields of the discharge filament. You have to watch the video carefully and rewind in the first 3 seconds to notice what I'm talking about here. The plasmoid balls seem to scatter once the secondary filamentary branches on the top-right of the discharge start to dissipate. What are your thoughts? To me, it's what my intuition seems to tell me. About three years ago, I was sitting out on my back porch, which faces to the east. I went out into the yard to look the other way, to the west, to watch a spectacular lightening display. There was lightening spraying from one horizon to the other, and lots of it. I watched this display for maybe an hour or longer, and then the lightening bolts got closer, so I went back on the back porch. No sooner than I got on to the tile floor of the back porch, than a pencil-thin bolt of some sort rose from the ground, very near where a DSL cable (dedicated subscriber line) was buried. Couldn’t have been more than 8 feet from me. Uh-oh, I thought and I turned around to go inside. But as I turned around I noticed a glowing ball, about the size of a golf ball or maybe a little bigger, no bigger than a tennis ball, that was sitting on top of the service panel (or box ,whatever you call this thing) and it sat there for a second or two, at most. Probably less, then it simply fizzled out. It just disappeared. So I went inside and went into the room which houses one of my computers, the main one of course. I couldn’t log on, because the system told me that there was a problem with the connection. Yes, there was a problem. The router that the signal went through was fried. The computer network interface card (NIC) was fried, The motherboard was fried. This happened downstream of the phone company’s “protection device”, and after my own “protection device.” It simply burned through both of them. It seemed to be such a small spark, but directly over the buried DSL line. Since I couldn’t get online, I went back outside after the storm had passed and sat down in my favorite chair. It wasn’t too long after that that the storms started up again, and the wind and the lightening started again, and in the midst of this I saw the most odd thing I think I’ve ever seen--a “bow” of lightening, no more than 10 feet (3 meters) high, that was moving at about 50 miles per hour (or something in that neighborhood, it was really hard to gauge) from the South to the North. This thing looked like an archer’s bow, bent in the direction of travel, except that it was about 8-10’ tall, and was about 75 feet above the ground. I use the existing pine trees for a gauge of height, as well as an estimate of wave height. The wave was traveling from the south to the north, at about 50mph, or thereabouts, and in a very short timespan, less than 5 seconds, there was a very large flash from the direction the arc was moving. There was a very big flash from the north, and a few seconds later there was a huge clap of thunder. In just a very few minutes--less that 5--there were the sirens of the local fire departments en route to battle the blaze caused by this fire.. It scored a direct hit on a house, which fortunately was vacant. Yikes! I just realized that I misspelled "lightning" throughout that entire post. kell1990 wrote: About three years ago, I was sitting out on my back porch, which faces to the east. I went out into the yard to look the other way, to the west, to watch a spectacular lightening display. There was lightening spraying from one horizon to the other, and lots of it. I watched this display for maybe an hour or longer, and then the lightening bolts got closer, so I went back on the back porch. wow, pretty amazing story... glad you`re still with us. About 6 years ago I saw something pretty amazing myself. It wasn`t as close as what you witnessed, but high up in the clouds. There was a thunderstorm some miles off in the distance with a thick cloud layer covering the whole sky as far as I could see. Then suddenly I saw lightning "sheet" starting far off in the distance and moving from cloud to cloud like a web towards my position. It was as if the whole sky (clouds) were filled with a huge electric web. This lasted only 1-2 seconds. The point from where it started to where the discharge went was about 10 miles... So it was big indeed. I could hardly believe what I just saw and if it wouldn`t have happened a second time I would have had some doubt! Did anybody else witness something like this before? I still maintain that the vast majority of the seemingly increasing incidence of UFOs being viddied and reported are actually increasing incidents of ball lightning. It just seems to go along with the over all up-tick of just about everything "anomalous," both with the sun, and this planet.